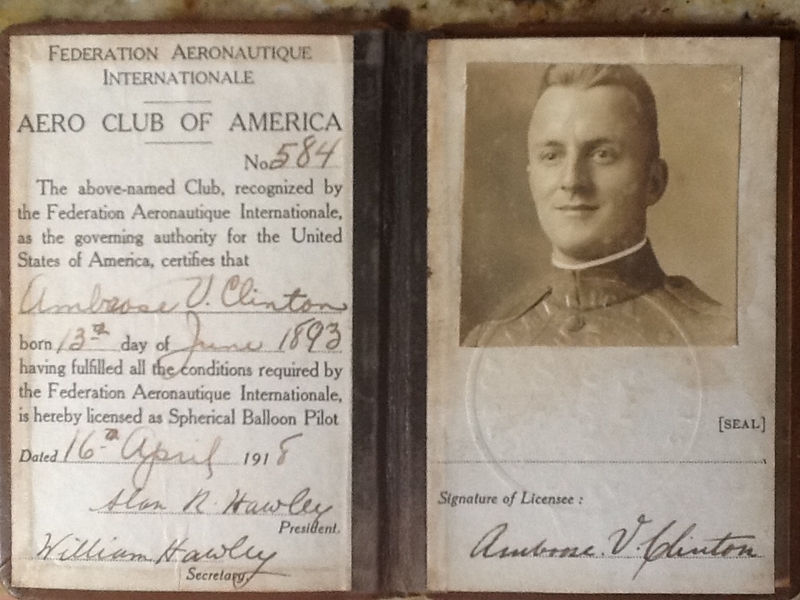 Ambrose Clinton was a crewmember on the Roma when the great airship crashed near Norfolk, Virginia on February 21st, 1922. He was one of 34 airmen who lost their lives in the crash; a team member of a crew of 45. The flight's commander, Capt. Dale Mabry was also killed. When I was researching the crash site of the Roma, Ambrose Clinton's granddaughter, Tracy Staley, contacted me with some interesting data on her aviator grandfather. Upon seeing the information and digging into some of the dates and records in his personal flight log, a rather fascinating story emerged. I wanted to share these findings. Ambrose Clinton lived an extraordinary life in an extraordinary time and lived his dream of "looking for excitement". Ambrose Victor Clinton was born in London, England, June 13th, 1893. He migrated to the United States, probably at a young age with his family. He was 23 years old and listed his occupation as a "lithographer" when he joined the US Army Air Corps in November, 1917. He had married Harriet Ciucevich and they made their home in Savannah, Georgia. They had one daughter, Ann, born June 5, 1921. Ambrose arrived at Fort Omaha, Nebraska on November 12, 1917 to begin training as a cadet. Bear in mind these were the very early months of U.S. Army Aviation! Ground schools had only begun aviation training classes on May 21, 1917! The US had only declared war on Germany in April, 1917! Fort Omaha had already become the nation's center for balloon training. He received his flying license Number 584, as a Spherical Balloon Pilot on April 16th, 1918. After the Air Course graduation date he lists "Rated B.O." meaning "Balloon Observation", and at that time he must have received his commission as a 2nd Lieutenant in the Army Air Service. Details of Lt Clinton's training is provided at left, under his picture. Though much of this information is speculative, where possible, I matched the description here with entries in his flight log. Given that Lt Clinton was at Fort Omaha from Nov 1917 to Sep 1918, he was there during the hustle and bustle associated with the "stand up" of a new military training unit. Though Ft Omaha was acquired by the Army in 1868, the Army Balloon School had only been established as a training field for balloon observers in March, 1917! Soon the army decided the weather at the Fort was not suitable for the rapid production of balloon officers needed for the building war effort, and training was moved elsewhere sometime in 1918. Nevertheless, Ambrose was probably present when, in May 1918 at nearby Florence Field two fellow airmen were burned to death when a Caquot-type balloon exploded. Here is a wonderful 20 min Army Aviation recruiting video "The Call of the Air" which shows scenes of the very locations Lt Clinton was at! And this video was made in the same period when Lt Clinton was there! At 2:37 into the video, it shows an aerial view of balloons being inflated at Ft Omaha, NE - and Mr. Clinton spent 80 hours training in this type of balloon at Camp Benning, GA during his infantry training! The video highlights the ZDUS-1 or the "Zodiak", which was a French airship purchased by the Navy, but operated by the Army (this was just before the Navy began acquiring and operating rigid airships). At about 5:49, the video also shows the C-2, sister-ship to the A-4 (The C-2 was twin engine, while the A-4 was single engine). At 6:16, the video changes to a shot of an airship, probably the ZDUS-1, so the video shot is probably FROM the C-2.) 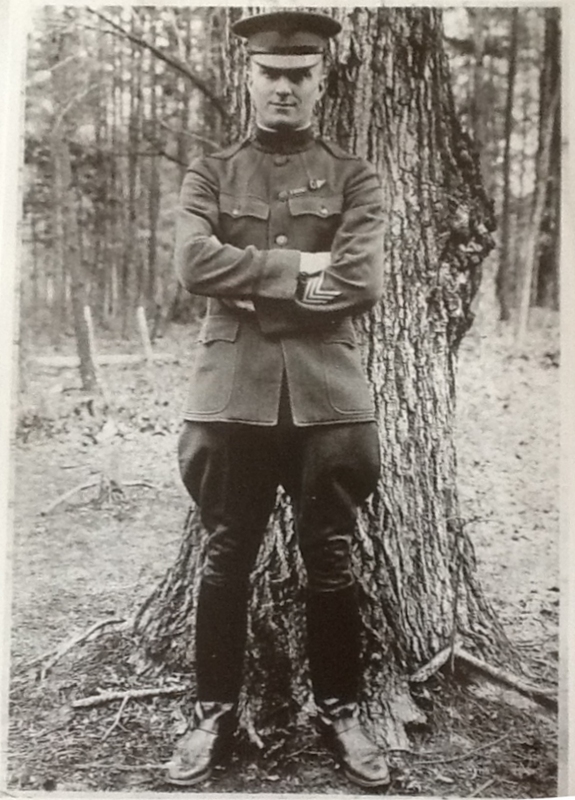 At 15:55, is a shot of Capt Dale Mabry, who later commanded the Roma and died in the Feb 21, 1922 crash. Ambrose recorded his transfer to Lee Hall on 16 Sep, 1918. He remained there till 16 Dec, 1920. Though his flight log records a total of 300 flying hours while at Lee Hall, no individual flights are recorded, so it is likely that his duties at Lee Hall were as training as observer for heavy artillery. The October 28, 1918 "Aerial Age Weekly" identifies the Lee Hall Balloon school as associated with such heavy artillery training. During this time of Lt Clinton's training, the war abruptly ended. No doubt Ambrose was caught up in the demobilization which began almost immediately upon cessation of hostilities on November 11, 1918. But by the end of 1920, he had over 500 hours of flying time, and had earned a flying position at Camp Benning, Georgia, on his way to assignment to Airships. 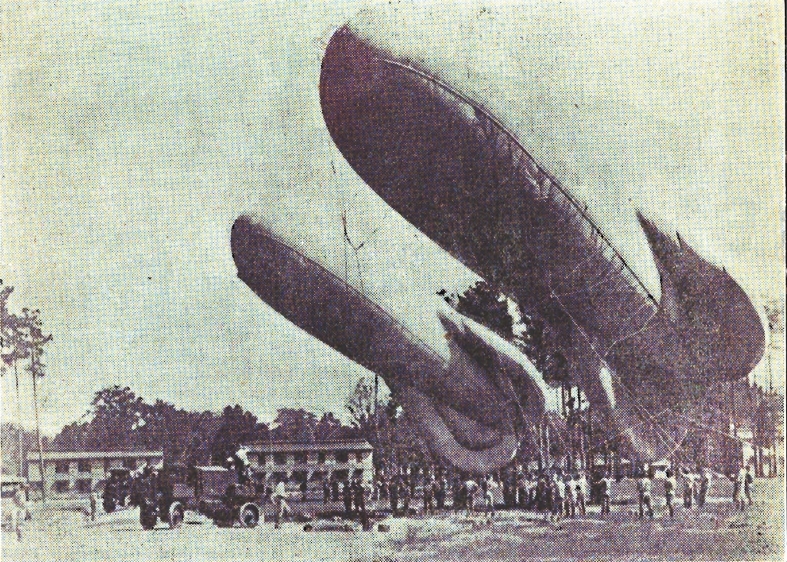 On 20 Dec, 1920 Lt Clinton was transferred to USA Balloon School, Camp Benning, Georgia. Camp Benning was an important facility. Omar Bradley, George Marshall, Dwight D. Eisenhower, and George Patton are familiar names of famous soldiers who trained there. During this period in military aviation, there was an ongoing argument that pilots should be commissioned officers. Though the Air Service defended its stance on commissioned officers as pilots, these years in particular, 1920-1921, were a time when many pilot slots were offered to enlisted men. Ambrose's flight log for 1921 shows he flew with many enlisted men. - 1/28/21 Regulation "A&B" Batt 83rd F.A. - 2/17/21 Vis good at 2000 feet but ordered down by Major Lovell did not observe Inft Problem for that reason. - 3/21/21 Flight to see if balloon can pick up Inf Signals. Panels rockets etc. - Wednesday March 16th 3:30 p.m. Hangar & Balloon wrecked by Tornado and rendered unserviceable thru no fault of any person but by an act of GOD. - 5/2/21 dropped basket parachute abt 500'. OK.
- 7/28/21 plane to Montgomery for Phys. Exam. - Oct 27th thru bomb at Presidential demonstration and acted as protection plane for Jt Air plane. Note: That last entry, Oct 27th, 1921 must have been most special for Lt. Ambrose Clinton. On October 26th, 1921, President Warren G. Harding spoke at Birmingham Alabama, making a notable speech - the first by a sitting president for racial equality. 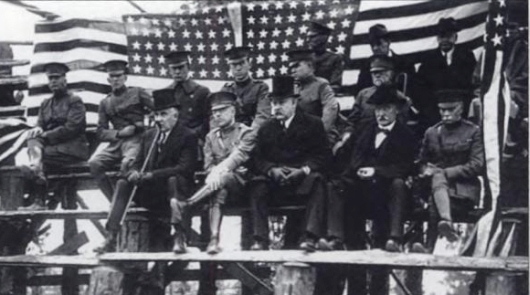 At midnight, President Harding's train left for Camp Benning, Georgia. Lt Ambrose was part of the "demonstration team" on Oct 27th for the President's 2 hour visit to Camp Benning on his way to Atlanta. At the close of the war, the Air Service had no airships and no personnel trained in operating them. 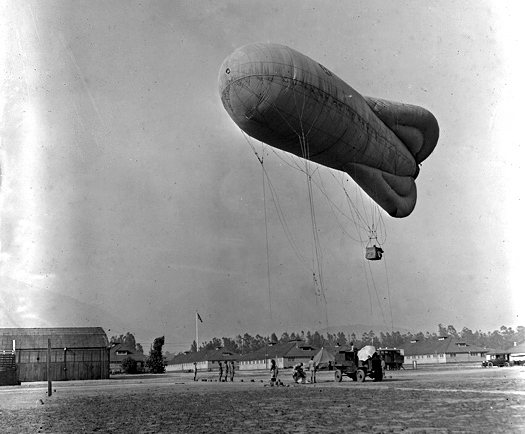 Following the Armistice, several officers and enlisted men of the A. E. F. balloon service received training in France, Italy and England. These formed a nucleus for training in this country, which training has been carried on as rapidly as limitations of personnel and equipment would permit. The Balloon and Airship Division is fully cognizant of the tremendous possibilities of lighter-than-air operations, particularly as regards airships. At present the Air Service is prohibited from participation in rigid airship activities by a joint army and navy agreement which gives control of this work to the navy. Every effort is being exerted, however, to develop the non-rigid and semi-rigid airship to its fullest capacity. Purchase of a semi-rigid airship of 1,200,000 cubic feet gas capacity from the Italian Government is being consummated. This airship is peculiarly fitted for army operations and is especially designed for operation in broken and mountainous country where high altitudes are involved. It has a cruising distance of 8000 miles and a useful load of 19 tons, weight of empty airship being 15 tons. During the year a large airship hangar was concluded at Langley Field, which was immediately utilized for equipment needed to operate the airship school at that station. There are now in use three sizes of airships for progressive, practical instruction of student officers and enlisted coxswains, engineers, radio operators, airship riggers, etc., the smallest size being a single engine type A airship of 95,000 cu. ft. capacity, the next size being type C twin engine of 170,000 cu. ft., and the third size being the Zodiac, a twin-engine airship of 325,000 cu. ft. capacity. The three airships at Langley Field are constantly used during the summer months for practical instruction and at times have been employed in airship squadron maneuvers conducted by radio telephone. That purchase of the semi-rigid airship from Italy was the Roma, and on Dec 21, 1921 Ambrose records a flight at passenger in the Roma to Washington DC. The flight, originally scheduled for 17 Dec, as a "christening flight" for the Roma, apparently timed to coincide with the 18th anniversary of the Wright-Brothers first heavier-than-air flight in 1903, was delayed due to engine trouble. Major newspapers across the country carried stories on the Roma's inaugural flight to Washington that day. Unsatisfactory performance of her engines led to a replacement of the engines with a "Liberty" type engine from late November, 1921 to February 1922. A typewritten note in the last page of the log says "Lt A.V. Clinton: Total time in Air July 1, 1921 to December 31, 1921 109 hours 47 minutes." While the Roma received her new engines, Ambrose records another flight in the A-4 as passenger on Jan 12, 1922. On Feb 2, 1922 he recorded "instruction work in A-4, learning controls in air" and "Landing". Landing the A-4 on Feb 2, 1922 was his last flight entry. On February 21st, 1922, Ambrose V. Clinton was on the Roma during a test flight with her new engines. It was her first flight with the new engines. The flight was from Langley Field to the Naval Air Station Hampton Roads, and somewhere along the way the controls began to malfunction, and over what is now the Norfolk International Terminal the Roma crashed and burned. Though a few personnel jumped to safety and survived, Ambrose Clinton did not. He died with the other valiant crew, one of 34 to die fighting to keep the ship in the air. I thought it fitting to end this tribute with the cover of Ambrose Clinton's pilot license. Ambrose was an aviator during an exciting time for flight. Such excitement would not return till the jet age of the 1950's and the space age of the 1960's. Experiences such as his will never again be possible. One thing about his life and times is certain: He achieved his goal - to find excitement! He lived to see his daughter, though she never got to know him. He died just 8 months after she was born. 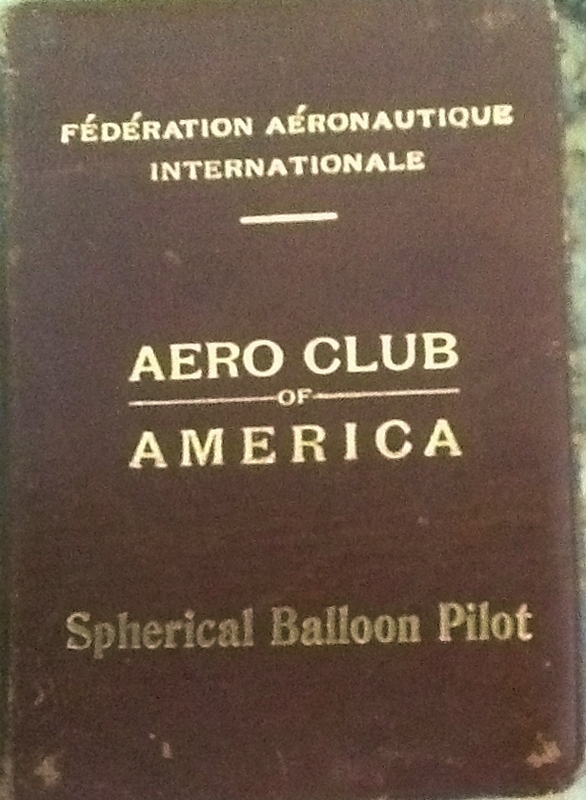 While data was gathered in 1921, before the Roma crash, and he never got to see it, Ambrose Clinton's name is in the 1922 "Who's Who in American Aeronautics" as "Balloon Observer and Airship, Langley Field, VA". 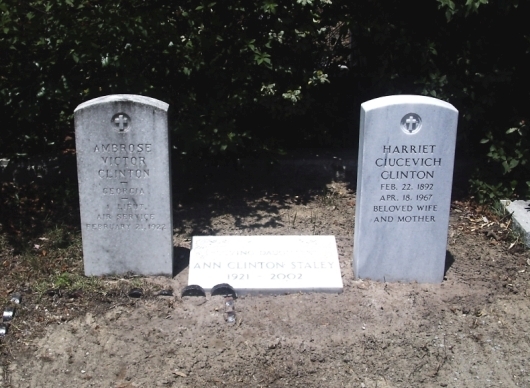 Ambrose is buried in Savannah, Georgia beside his wife, Harriet. A marker identifies their daughter, Ann, who died in 2002 and is buried at Arlington National Cemetery with her husband, Lt. Col. Francis X. Staley. Return to the "Roma" page.